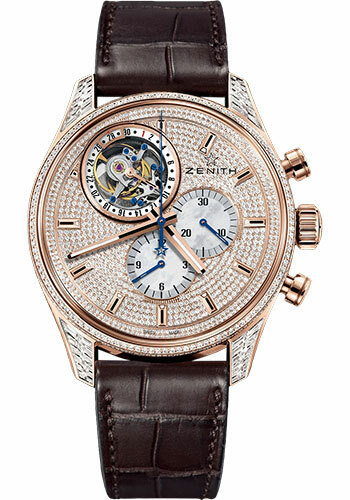 44mm 18K rose gold case set with baguette and brillant diamonds, diamond paved dial, automatic El Primero 4035 D movement with hours and minutes, small second, chronograph, date, tourbillon, approximately 50 hours of power reserve, rubber lined brown alligator leather strap with gold folding buckle. Water resistant to 3 ATM. 44mm 18K white gold case, silver sunray dial with black and blue counters, automatic El Primero 4035 D movement with hours and minutes, small second, chronograph, date, tourbillon, approximately 50 hours of power reserve, brown alligator leather strap with triple-folding gold buckle. Water resistant to 10 ATM.